We've compiled everything you might want to buy here on this page. Some things are through PayPal, some are through outside vendors. If you have any questions, please contact the Committee Chair responsible for the item you are trying to purchase. Yearbook orders are placed via the Josten’s website and are $23 each. The Harper Chorus is a traditional choral experience using a wide variety of musical styles, from folk and classical to popular music. The students will learn to sing in unison and in parts while learning to work together as an ensemble. There will be opportunities throughout the year for solos and small group experiences. Members will study the fundamentals of singing, learn the language of choral music, and prepare for public performances. 1. The Harper Chorus rehearses Tuesday and Thursday mornings before school from 7:50-8:30am in the auditorium. 2. It is essential that students are on time for rehearsals, as the first 15 minutes are dedicated to warming up their voices and working on fundamentals. 3. Students are expected to sign in when they arrive. Membership is open to students in grades 2, 3, and 4 at Harper School. Fee is $60.00 for each semester. Please fill out the form below to register your child for Harper Chorus. Chorus registration fee is $60 per child. Each year Harper PTO offers awesome Spirit Wear for purchase at the beginning of the school year so everyone can get in the spirit of supporting our amazing school! Merchandise will be displayed at a variety of events this year, starting with the New Family Welcome Night for new Harper families and Opening Coffee on the first day of school. 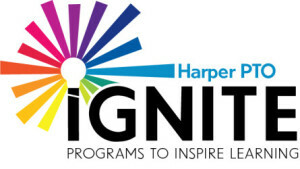 iGNITE (formerly known as Advance to Go) is an initiative led by Harper’s PTO that is dedicated to finding and bringing our students exciting, multi-sensory programs and activities that accelerate a passion and depth of learning. What you might not know is that these programs are NOT paid for by the school district. They are primarily funded by Harper families through our annual fundraising initiative. Calling all Chess Masters! Harper Chess Club offers fun games and lessons for ALL levels of chess ability! Our Chess Club meets on Mondays after school in the Harper Cafeteria in sessions offered throughout the school year. This information is only on the Wilmette Park District website (search for “Harper”) and not in the Park District brochure. Children will be dismissed from their regular classroom and checked in at the cafeteria by the Chess Enrichment instructor. The children will be brought to the front entrance of school at the end of the class (4:30 pm) to be dismissed. Children are expected to be picked up on time. In compliance with the school snack policy, children may only bring a fruit or vegetable snack to have prior to class starting. The park district will not be providing any snacks. For more information about Chess Club, please contact Haylee Kessler, Recreation Activity Coordinator at 847/853-6297 or hkessler@wilpark.org.